The rains have arrived and the weather has become cool and pleasant! A perfect day to have a one pot meal. 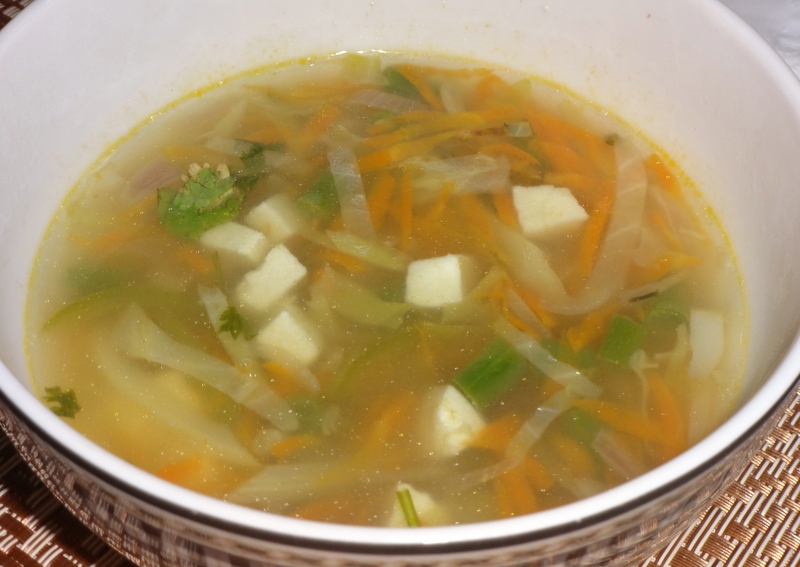 I love Thupka soup for its perfect mix of carbs and proteins. It is nourishing and so so delicious. Do give it a try. Heat oil in a pan and throw in the chopped spring onions. Fry these till they are translucent. Now add the ginger garlic paste and stir well. Add the sliced mushrooms to the pan now. Stir and cook for a couple of minutes. 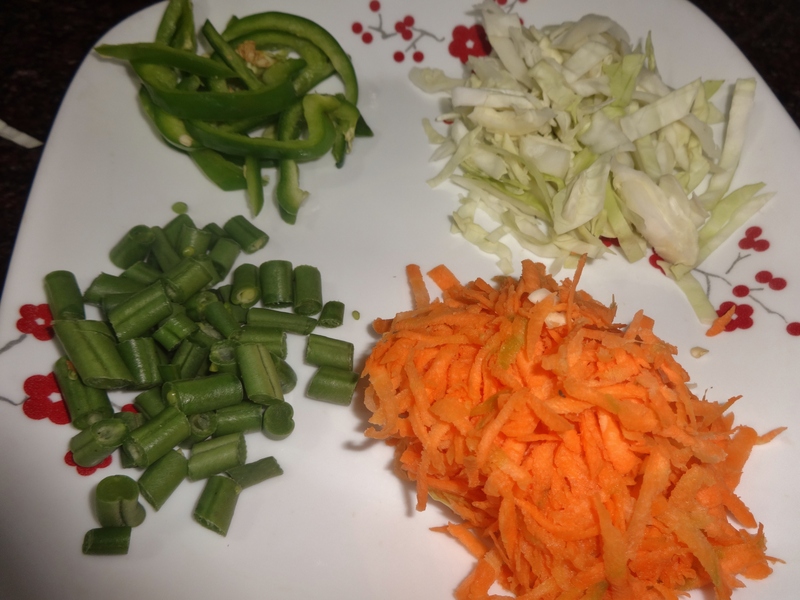 Now toss in the carrots, green chilli and chicken. Mix well. Cook on medium heat for 2-3 minutes. 3. Add the tomato paste and tomato ketchup and cook for another 2 minutes. Then add 600 ml of water and let it cook for 10 minutes. Season with salt and pepper. 4. Separately boil egg/rice noodles. Drain the water and keep the noodles aside. 5. Now add the spinach to the pan. After 2 minutes throw in the cooked noodles and also add the soy sauce. Let the broth simmer for 2-3 minutes as the flavors seep into the soup. 6. Squeeze the lemon juice into the soup. 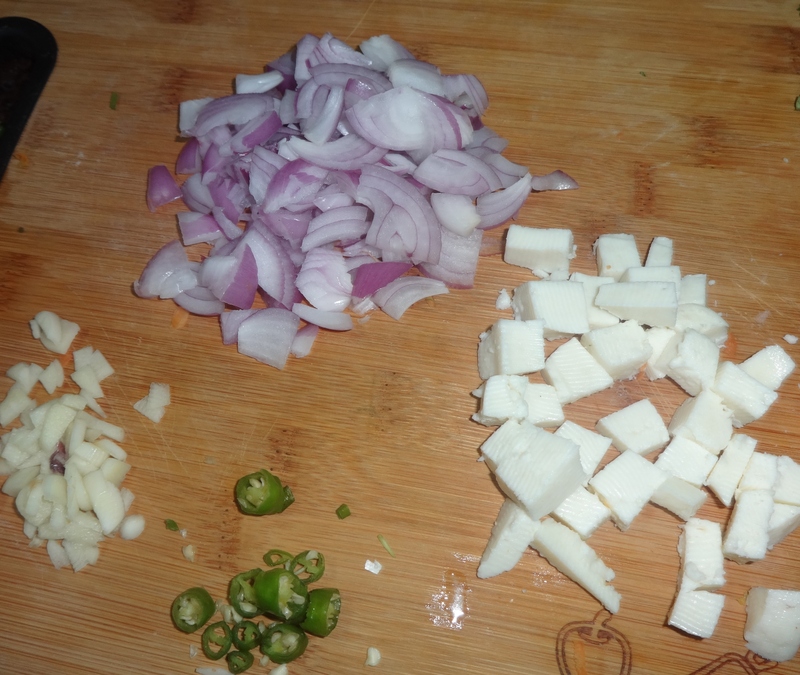 Then garnish with chopped cilantro and the green part of the spring onions. Cold winter evenings call for hot and hearty soups with a side good nutrition thrown in! 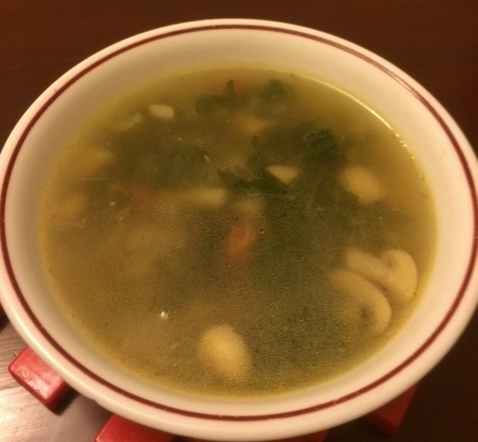 I had some spinach and mushrooms which are good for soups separately on their own. I decided to experiment and combine both. 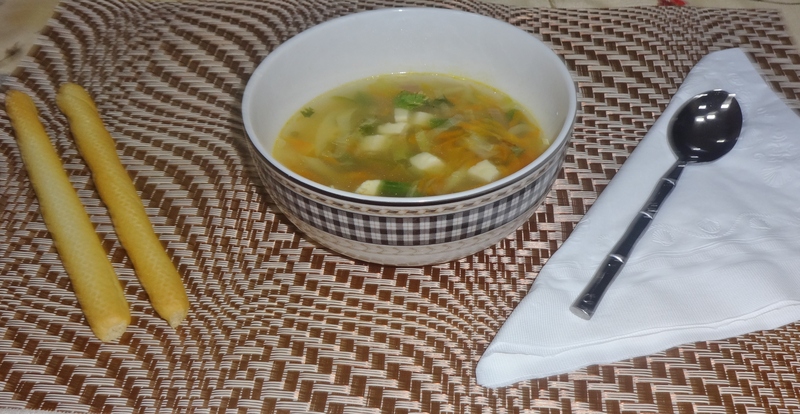 The result was a yummy soup which was loved by the whole family! Makes about 4 servings. Boil spinach in a little water, along with chopped onion and ginger (you can also do this in a microwave) till the spinach leaves are soft. Cool and then grind in a blender. Keep aside. In a pan, add butter and melt. Now saute the chopped garlic till it begins to boil. Now throw in the sliced mushrooms and stir till the mushrooms start to release water. Add the flour and saute for 3-4 minutes, stirring frequently. Add the black pepper and saute for half a minute. Then add the spinach mixture and stir well. Add the cream and the coriander leaves and stir well. Sprouts are a super super food which I would love to include more in my diet. They are loaded with vitamins, minerals, proteins and antioxidants. My usual way to eat them is to add them to salads. So when I came across this awesome soup recipe using sprouts and a whole lot of healthy vegetables, I couldn’t wait to try it. This powerhouse soup was delicious and nourishing. I realized sprouts are extremely versatile and can be added to stir fry veggies, in soups, in salads, in sandwiches and even as pizza topping! 1. Wash the sprouts and boil them in 4 cups of water. Drain and keep aside. Do not throw the water. 2. Mix the cornflour with 1/4 cup water and keep aside. 3. Heat oil in a heavy bottomed pan. Add garlic and then the onion and stir for a minute. 4. 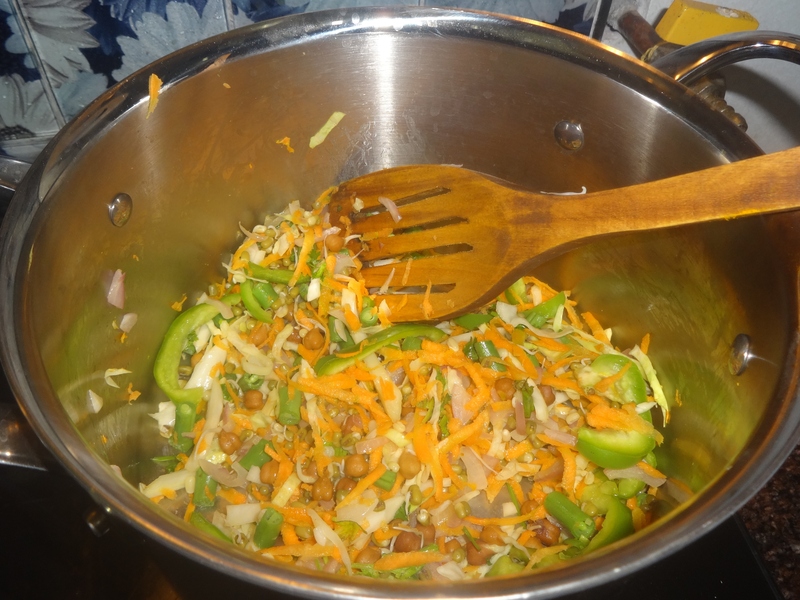 Add the sprouts, cabbage, carrot, capsicum and beans and mix well for 3-4 minutes. Add the green chilli and chopped coriander and mix well. 5. Add the stock (the water in which the sprouts were boiled). Let it come to a boil and simmer for 3-4 minutes. 6. Add the salt, chilli sauce, sugar and cornflour paste. Mix well and let it boil for another 3-4 minutes. 7. Garnish with some paneer pieces and serve hot with bread sticks. 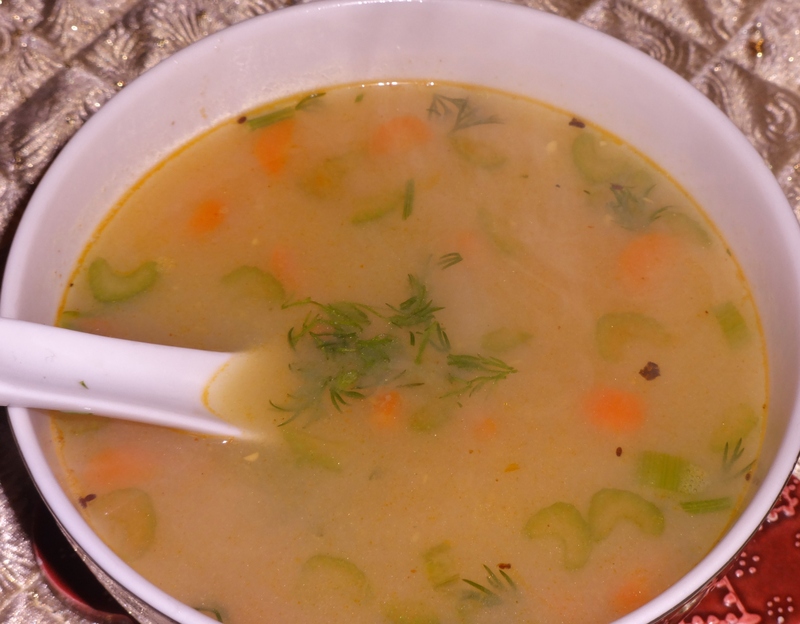 The cold Delhi November evening called for a warm, nourishing soup! I explored Khan Market for the ingredients and to my pleasant surprise, I found many shops selling groceries which I was used to in America. I quickly picked up everything I needed and was able to make this super healthy and tasty soup for dinner. 1. Heat a pot and melt butter. Add the chicken pieces and stir well with a little bit of salt. Saute till the chicken changes color and becomes a little tender. (About 5 – 7 mins). 2. Now add the garlic and saute for a minute. Then add the onion and stir till it turns pink. 3. Throw in the rest of the vegetables and stir well for a couple of minutes. 4. Add the chicken broth and bring to a boil. Simmer for 10 minutes. 5. Serve hot with a crusty roll of bread. I love tortilla soup and decided to try out this easy, vegetarian version. My friend gave me some organic tomatoes from her garden and I used these as the base for the soup. 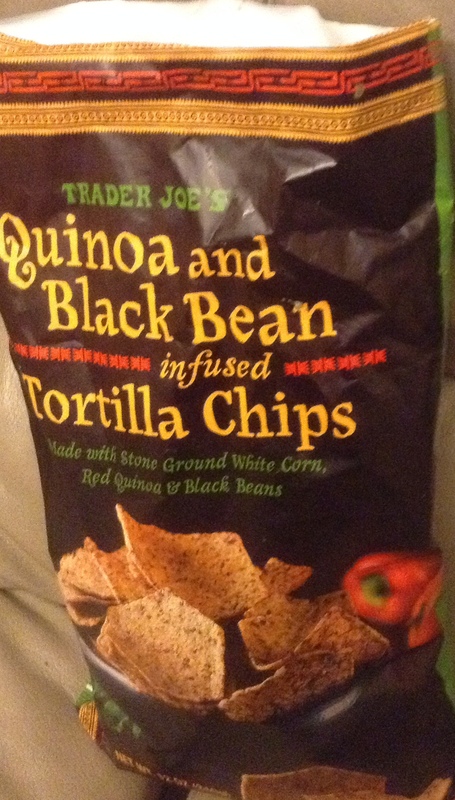 I was too lazy to bake or fry the corn tortillas and ended up using Trader Joes healthy quinoa and blackbean tortilla chips! 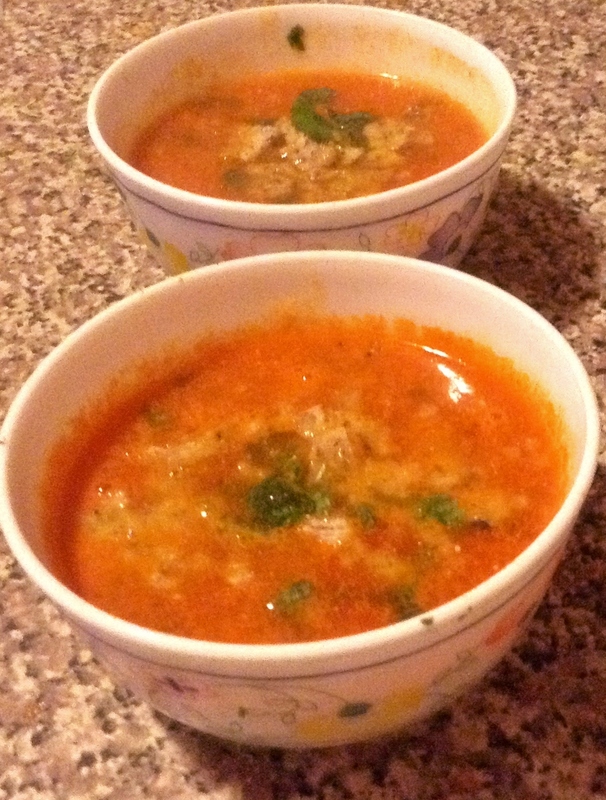 The soup was flavorful and nutritious and was a hit with the family! 1. Puree the chopped tomatoes and keep aside. 2. Heat butter in a pot and add the onion. Saute till it turns pink. Add the jalapeno and stir well. 3. Add the tomato puree and season with salt and chilli flakes and mix well. Simmer for 5-7 minutes. Add in the sour cream and half the cilantro and stir well. 4. Garnish the soup with the tortilla chips and the remaining cilantro. Serve hot! This winter looks to have no end in sight! The cold and snowy days need warm comfort food to make us feel better. I have been on a soup binge in these frigid temperatures. Today’s soup was a quick and easy corn and dill soup. Dill adds a distinct and aromatic flavor to this no fuss soup. It belongs to the same family as parsley, bay leaf and cumin and contains substantial amounts of iron, manganese and calcium. It also contains flavonoids which are powerful antioxidants with anti-viral and anti-inflammatory properties. 1. Melt butter in a pan on a low flame. 2. Add the chopped celery, garlic and carrot and saute for a few minutes. 3. Now stir in the cream style corn, chopped dill(reserve a few leaves for garnish), salt and curry powder. Add 4 cups of water and simmer for 10 minutes. 4. Garnish the soup with dill leaves and serve hot.